When I first started really learning about herbs, I kept hearing a couple of my herbal teachers speak of an herbalist, Maurice Mességué, who was famous for using herbal hand and foot baths to address his clients’ concerns. I found the method intriguing because at the time, I hadn't heard much about using foot baths therapeutically, so I picked up a couple of Maurice's books. His autobiography is one of the most entertaining books I have ever read, and it really gave me an interest in using herbs this way. 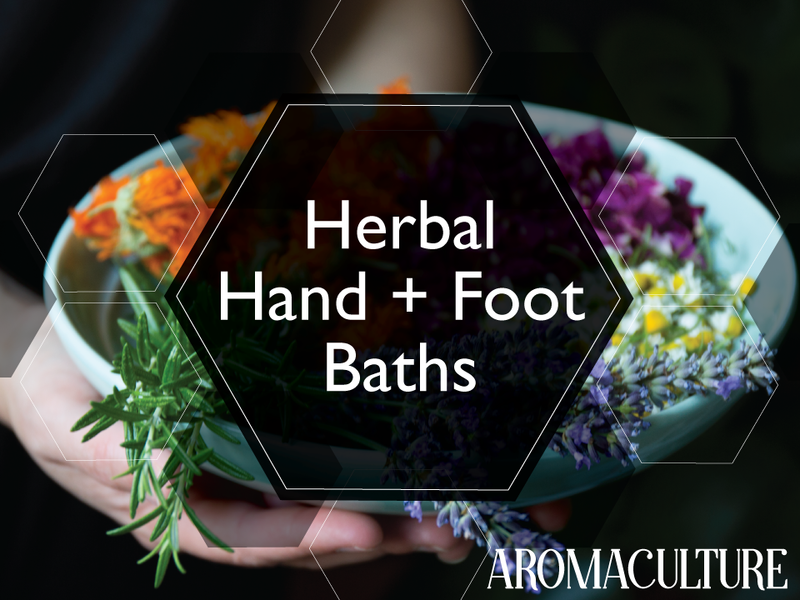 I immediately started experimenting with herbal hand and foot baths myself and they have since become one of my absolute favorite ways to use herbs. Today I’m sharing my go-to herbal foot bath recipe for when I’m feeling a bit yucky – a headache coming on, a touch of queasiness, or that overtired and overwhelmed feeling that sometimes hits at the end of a long day. This blend is relaxing, refreshing, skin nourishing, and looks absolutely beautiful in the foot bath. Depending on what else I'm dealing with, I'll also add some mix-ins. I start by putting the kettle on the stove so the water can get to a boil while I'm blending together the herbs I want to use. Use a large bowl so that the herb blend fills it only about 1/3 to halfway so the dried herbs have plenty of room to expand once they're rehydrated. Pour freshly boiled water into the heat-safe bowl until all of the plant material is covered, then cover the bowl with a plate to seal in the steam and let it steep this way for 10-15 minutes. Pour the entire mixture into your foot bath basin (or whatever vessel you're using - hand bath bowl or bathtub, etc. ), then add in any hydrosols or other ingredients you plan to use. Fill the remainder of the basin with enough hot water to cover your ankles once you've submerged your feet (or your wrists, if you're bathing your hands). Follow up the bath with an application of foot cream and a pair of cozy socks. Have you ever experimented with herbal foot baths? They’ve really become one of our favorite ways to enjoy herbs. Newer PostIntroducing Our New School!